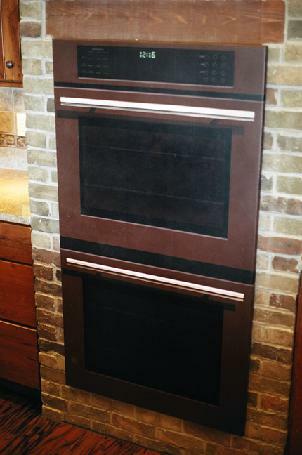 Here's something fun: a client was about to put a new home on display, but the high-quality appliances would not be delivered in time. Determined not to show a beautiful new home with gaping holes in the kitchen, he comissioned me to PAINT all of the appliances on furniture-grade plywood, which I accomplished in time for the open house. In addition to the double oven on the right, I painted a gas range and dishwasher. I spent a few minutes in the kitchen during the open house that weekend, watching visitors NOT NOTICING that the "brushed-bronze" appliances weren't real!